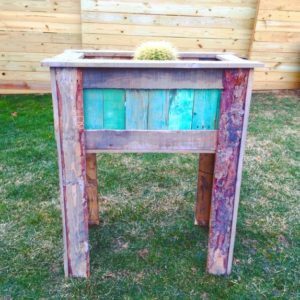 I love working with pallet wood. Each pallet board is unique in character, and has a mysterious story of travels and escapades that I’ll never know. 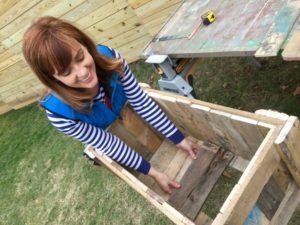 It’s fun to think that the parts to this planter box could have been anywhere in the world and transported anything from tools to furniture to books and so much more. 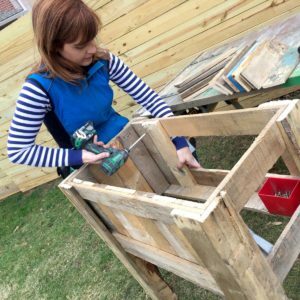 So enough about my romance with pallets, let’s dig into the DIY of making this pallet planter box. 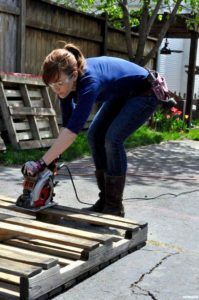 Pallet woo d. Many Habitat for Humanity ReStores have pallets, as deliveries from donations sometimes arrive on pallets. 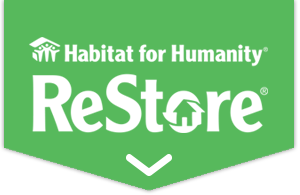 Your local ReStore may also offer a delivery service, too. Saw. 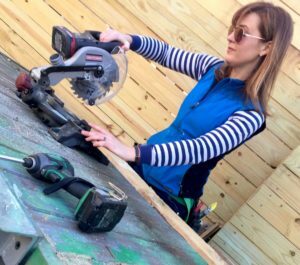 A circular saw, miter saw, hand saw, table saw, or oscillating tool would all work. 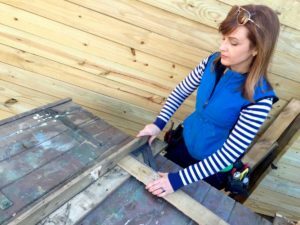 I used a cordless miter saw. Hand tools. 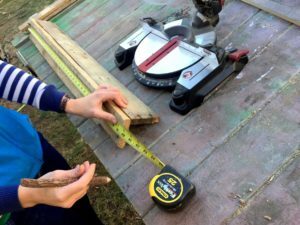 The essential hand tools of a tape measure, pencil, multi-tool, pliers, hammer, and utility knife are part of a pallet DIY kit. 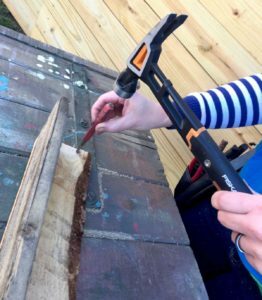 The pliers, multi-tool, and utility knife are good to have for those pallet boards that have a rogue shape or nail sticking out from its previous life. Also, working solo on a project, it’s a good to have clamps nearby. 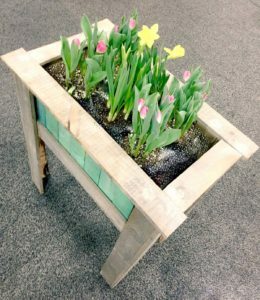 For this project, I used parts of two pallets. 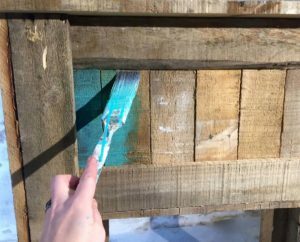 To free pallet wood from a pallet, there are two ways that work really well. 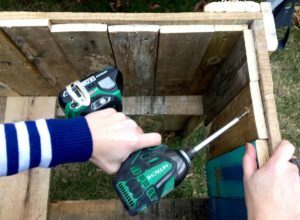 Either cross-cutting them along the supports with a circular saw or cutting the fasteners between the wood and the support with a reciprocating saw. 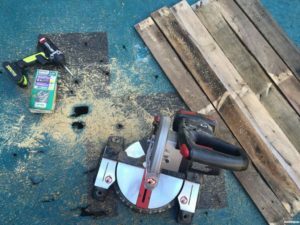 A hand saw or an oscillating saw could free the wood, but it will take a bit longer. When working with saws, wear your safety glasses and closed-toe shoes. 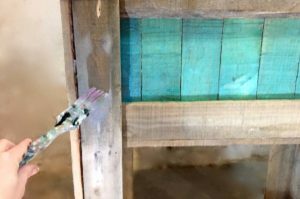 Cross-cutting pallet wood along the supports with a cir cular saw is a fast way to free pallet wood for a project. After freeing the wood from the pallet, measure, mark, and cut the wood to length. 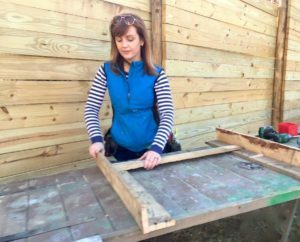 This pallet planter is 40 inches tall, so I’m cutting two 40-inch long pieces to make each of the four corners for the box. If you have shorter lengths, you can add a block at the connection points to join the short pieces to make a 40-inch length. 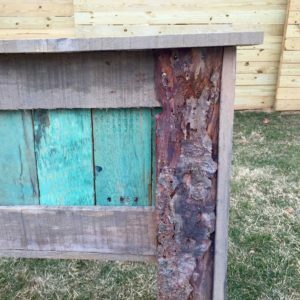 With pallet wood, there are unexpected nails that may be proud of the wood, so a nail set and hammer can help push the nails back into the wood. 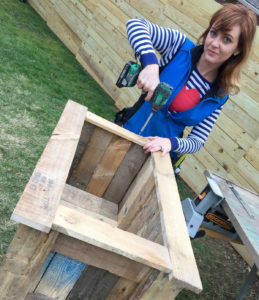 After the frame of the box is secure, the sides are filled in with more pallet wood. 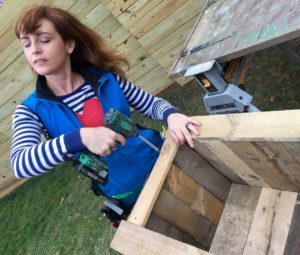 I like to hide fasteners on decorative projects, so I’m fastening the wood from the inside of the box. 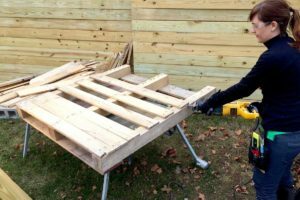 The wood thicknesses of pallets can vary slightly, and screws are spot-on the same length. 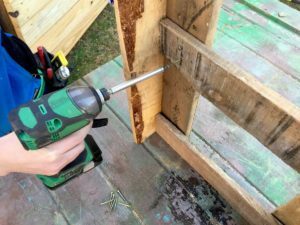 An easy trick to make sure you don’t pierce through the other side of wood is to angle the way the screw goes in. For this project, I put in the bottom without attaching the pieces. This will make it easy to clean out the planter later. 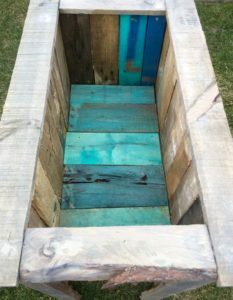 And if you are thinking that this might be perfect as a party drink station, the easy access to draining the bottom of the box will make party cleanup easier. 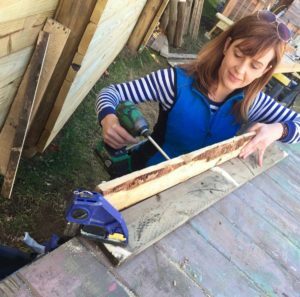 Yes, you can have a meditative glamour moment when you do DIY, especially when you putting in the final fastener. Hooray! The inside of the planter is ready for plants. And you may not be able to see in the photo, but I dusted some glitter spray paint over the entire planter. 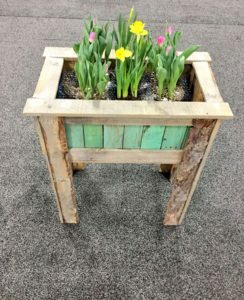 It’s a subtle way to have fun moments of shine and glamour on a farmhouse-style planter. 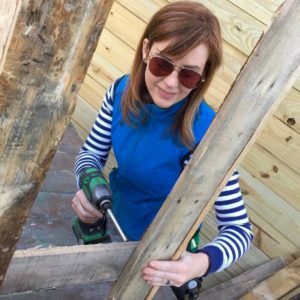 You can find more projects from Theresa at MyFixItUpLife.com, and you can get in touch with her on Twitter for any DIY questions you may have! For more project ideas and supplies, visit your local Habitat for Humanity ReStore at 600 16th St, Vienna, WV. Check us out online or on Facebook.